The School of Beshara, now called The Chisholme Institute, has been fundamental to my growth as human being. It has helped turned me into a lover of Truth. It has established in my heart a way of being, a way of life that feels so real, kind and genuine. One which I am happily walk on. It has given me another level of understanding of what it means to be a muslim in its essential meaning, a person who is in total surrender, who allows peace of perfection to manifest. I am not there yet. But I am sure aspired to it. And I cannot thank God enough for the opportunity. Spirituality is not separate from everyday life. It is, in fact, as the name indicates, the very spirit of our everyday life. The Light that guides us in our every step, if we allow it to do so. It reminds us what it means to be human, why we are here on this universe of senses, and how we can act accordingly. A considerable process of unlearning and being let go(d). This matter is closer than we think, and doable, too. 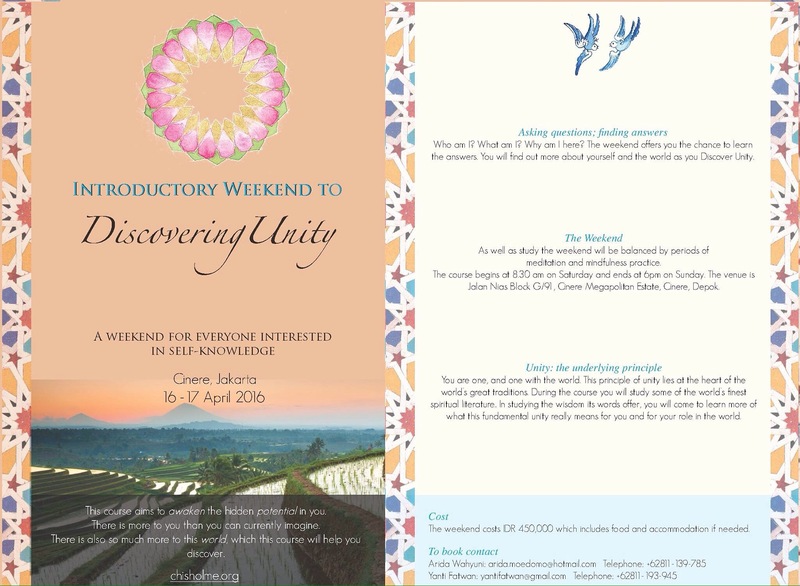 The school is conducing a short weekend course on Discovering Unity next week’s weekend, near Jakarta. It would be a pleasure to have you there. This entry was posted in Uncategorized on April 8, 2016 by Eva.